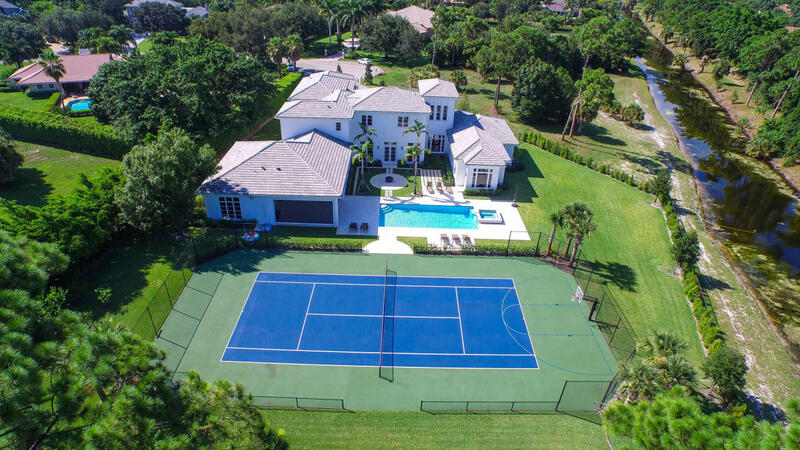 Fresh on the market sitting majestically in Palm Beach Gardens, Florida is this contemporary marvel. Serenely situated on over an acre, this 5 BR/5 BA/2 half BA Steeplechase abode offers a tranquil sanctuary setting in its 7,370 square feet of dramatic open living space. A chef equipped style kitchen is fully loaded with sleek black granite counter tops and full suite of Thermador appliances, custom cabinetry, two gas range stoves, and full size refrigerator and freezer. Every room has soaring ceilings and spectacular views of the meticulously manicured resort inspired pool oasis. 7744 Bold Lad Road is located in Palm Beach Gardens and is currently asking $3,495,000. Steeplechase is a premier estate community privately tucked behind a gated entrance in Palm Beach Gardens. In addition to the chic designer appointments inside the estate the expansive outdoor covered lanai with a signature summer kitchen including a 42” bar-b-que, refrigerator and sink will please any grill master. The sparkling heated pool and spa, cozy fire fit, spacious tennis/basketball courts and citrus trees are just a few more amazing conveniences showcased in this gem. Located on Northlake Boulevard just south of PGA Boulevard, residents of Steeplechase also enjoy close proximity to upscale shopping and fine dining at nearby Gardens Mall and Downtown at The Gardens.